Let’s start a new journey in pattern alterations with a series of videos that I really enjoyed. I’m always on the lookout for good sewing techniques videos because I’m a self-taught seamstress and I live in the French countryside with no chance of having sewing lessons in the vicinity. Today’s topic will deal with the bust. It won’t be an exhaustive list of videos covering any aspect of SBA/FBA, but rather what I needed in my own situation and which videos I found useful on the web. Aneka, from Made to Sew, has an rather extensive list of videos that appealled to me. Craftsy and Creativebug also have a wide range of classes, but you will have to buy them. 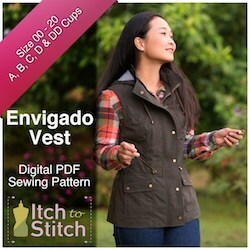 Creativebug has a generalist class called Adjusting Sewing Patterns. Craftsy is more detailed with a bunch of fitting classes like Adjust the Bust: The complete guide. Craftsy now offers a yearly subscription through Bluprint (all-you-can-watch videos for $120/year or $14.99/month). 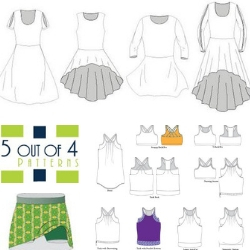 Books are also available if you want a more in-depth look at pattern fitting and alterations. That's true that when you start sewing for yourself, you face serious challenges. Before, I would sew one size and tried to make it fit. But I ended up being depressed about the result that was too tight/loose, too/long/short, etc. Being a tester for various designers taught me that I have narrow shoulders, a short torso, etc. So it is really important to check your measurements against the pattern's chart OR to put the pattern pieces (minus the seam allowances) against your body OR to check the finished measurements. I did that for, say, the Chai shirt and the Blixen Blazer. If you want to adjust your bust, the first thing to know is the position of your bust apex. Get some help while measuring yourself because contorsion means distorsion! At 8:10, she's already explaining where to place the bust apex on your pattern. So you have your bust apex, now it's time to move those darts. The video embedded below is by far the best I've watched about moving darts. I hope that these 3 videos will be useful. They really were for me and increase my self-confidence in my sewing abilities. And it was a huge booster. Do not hesitate to add your favorite sewing /fitting videos in the comments, I'd love to watch them and learn new techniques about fitting the bust area.